In today’s society, we consider being online and constantly surfing the web a cultural norm. Therefore, it is not surprising that online communities have formed to pull people with similar interests together. Spoon University, a global community composed of mainly college students and millenials that share a passion for food, is an example of one of the many communities bringing people together. As stated by Sarah Adler, one of the founders of Spoon University in a Q&A, “Spoon has communities all over the world, with thousands of members, reaching hundreds of millions of people every month” (1). Spoon University is a website that features recipes, restaurant recommendations, and college dorm and dining hall hacks. Through Spoon University’s numerous social media accounts, college students are able to publish and view videos, pictures, and articles related to food. Spoon University produces work that especially target college students, which helps create a sense of community among students with a passion for food. Spoon University also has “chapters” at colleges across the nation, where students involved in each campuses' Spoon University can connect online and in person with other members. As mentioned by Maya Kosoff, an author of Business Insider, “Spoon University has 120 participating college campuses, including schools like Penn, NYU, Dartmouth, and Michigan, with 3,000 students actively contributing stories, photos, and videos to the website” (3). Even though students at the same university are able to meet in person, Spoon University is rooted online. Through the internet, Spoon University has now expanded to reach and connect people from all over the world (1). In fact, when asked about Spoon University’s mission, Adler mentioned that “What used to be print magazines and television has moved online, and online has moved onto social media” (1). Spoon University’s creation of an online community through social media is clearly seen on Spoon University's Facebook page. The posts on the Facebook page are produced by current members of Spoon University, who can apply online through SpoonUniversity.com. As mentioned by the co-founder of Spoon University, Mackenzie Barth, “'Any time a student joins the network, they go through training. They learn about SEO, headline writing, food photography, social media strategy—everything you’d need to know in digital media. And then we give them the platform to be published and we give them the analytic'” (6). The Facebook page allows for this platform. On the Facebook page, only actual members of Spoon University who have gone through and completed the training, are able to make a post of their food related work on the page. However, the Facebook page can be viewed and utilized by anyone interested in Spoon University, whether they are a member, non member, college student, or a non college student. That is what makes the Facebook page for Spoon University such an inclusive online community. Those wishing to comment on the Facebook page or like posts must have a Facebook account, however non Facebook users can still view the page and look at others posts and comments since it is a public page. On this page, individuals are able to post and like topics posted by others, and communicate with one another online. Most of these comments and posts are produced by college students seeing as, “Spoon University caters specifically to millennials, offering both localized and more general stories about food, wellness, and lifestyle that are relatable and accessible to young people”(3). The interaction of this online community is achieved by commenting on posts, reacting to a post (with a like), or sending a direct message. Makenzie Patel, a writer for Spoon University, used the Facebook page to reach out to the deputy editor of Spoon University, “'She responded to my Facebook message fangirling over her Medium piece'” (4). The direct messages sent to other Spoon University members allows users to further connect with others and expand their knowledge on certain things posted on the page. The fact that college students are the majority users of this page make the commenting and sharing function on posts highly utilized aspects of the page (1). As stated by Sarah Merrifield, a TCU student who has been a member of the Spoon University Facebook page for about a year now, “I love looking at Spoon University’s posts because a lot of the time they have dorm room and dining hall meal hacks, and I always share those with my friends at other schools” (2). Students, like Sarah, are able to interact with others through the Facebook page in many ways. They can comment, share, or like a post on the page. By a user sharing a post they enjoyed with another person they feel would also like that post, a connection is formed and the online community further expands. The formation of these connections and relationships are an important and enticing feature of the Facebook page because as mentioned by Jocelyn Hsu, an editor for Spoon University headquarters, “94% of our members say that it's important to them to feel connected to other members. One member said, ‘I don’t play a sport or instrument, but through this I can meet new people with different hobbies [and] love to eat just as much as me!’”(5). In addition, as seen in the bottom left corner of the image on the right and the image on the farthest right, a post by Spoon University was shared by 8 people, including the Cal Poly Spoon University account. Through this sharing feature, the Spoon University chapters at different schools across the nation are able to share their work with everyone involved in Spoon University, not just those at their specific college. This allows each individual Spoon University chapter to further expand their presence and meet other members who could have potentially liked or commented on one of their pieces of work, whether it be a video, article, or image. On the other hand, if a member of the Facebook page who is not involved in a chapter at their own school sees this post, it can intrigue them to want to either join or start a chapter of their own. As stated by Maya Kosoff, an author of Business Insider, “Students see Spoon University's stories and videos online, and write in to ask how they can start their own campus chapter” (3). The platform that the Facebook page presents allows these online community members to share their own work and receive inspiration from other passionate foodies. The commenting feature on posts also truly makes this Facebook page an interactive community where those involved in the page can communicate and share their ideas with others. For example, as seen on the images of a post below, individuals comments often include an opinion they had and a mention of another user. The user they mentioned, or whoever else wants to repond, can then respond to their comment. This link of comments creates a conversation and allows users to meet others who share the same opinions or perhaps has opposing ideas. This post in particular shows an individual who was interested in a Ferrero Rocher cake post, who then created a conversation among two other users, by simply mentioning their feelings about the cake and someone else's name and in a comment. This conversation is significant because it shows how those who find interest in food related topics have a safe place to express their feelings and opinions with others who feel the same way. Another aspect that makes this online community such a useful tool in connecting students together is the large platform that the Facebook Page creates. 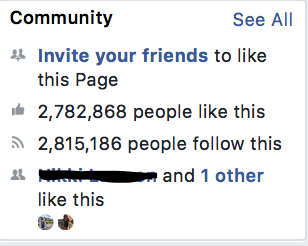 As seen in the “Community” box, featured on the Facebook Page, the Spoon University page currently has 2,815,186 followers. These followers include individuals of all backgrounds from all over the world (6). Due to the diversity among followers, users are able to connect and introduce their ideas and work with a vast amount of people all through one Facebook page. As mentioned by a student from Northwestern University, "With a campus publication you might only have your content seen by people on your campus, but publishing on Spoon University means the reach is so much greater. You can actually feel like your piece of work you've put a lot of effort into is being seen by a lot of people" (3). The huge community created by the numerous people choosing to follow Spoon University’s Facebook page has fostered a space for college students to share their work with people from all over the world, allowing those who post to build up their audience and potentially make a positive impact on many others. The purpose of this Facebook page is to create a community, composed of college students and those interested in expanding their interests in food, that fosters the growth of individuals interested in creating and sharing their food related work with others. A goal of this page is to empower students to share their voice and ideas with others while improving their media and writing skills. Since Spoon University members, who are also college students, are the principle creators of the posts, this online community serves as a place for them to produce their food related work, like videos, recipes, and articles with others, whether they be Spoon University members or not. These students are able to build up their publication experience in the safe community of the Facebook page, where those who post know that the people viewing their posts are people just as passionate about food as they are. In real life, Spoon University has members at many college campuses across the world, but it is not realistic to be able to communicate and meet all the Spoon University members from the various universities in real life. Through the Facebook page that Spoon University has created, members from their own school's Spoon University are able to share their work with students at other schools. This page also serves as a place for college students and people interested in food to communicate with one another, allowing users to build up relationships and hear the opinions and ideas of others. College students like me, who follow the Facebook page just as an interested student with a passion for food, are able to see the works and ideas of others and share the things we like and have opinions on with others through the communication features of the Facebook page. Overall, the Facebook page is a place for Spoon University members to share their work with individuals across the nations, and allow followers of the page to comment and share their opinions with others in a safe place that fosters the development of an inclusive community.